Family owned and operated since 1982, Quality Overhead Door delivers the best service and garage doors in Fulton County, Ohio. We place a focus on personalized care and long-term relationships as we serve residential and commercial customers in Northwest Ohio communities and towns in Southeast Michigan. Beyond garage doors, we offer fireplaces, awnings, storm doors and entry doors. When you’re considering a garage door or something more for your home, trust Quality Overhead Door. At Quality Overhead Door, we only offer products made by the most trusted manufacturers in the industry. That means garage doors from Clopay®, Wayne Dalton, CHI and Raynor, as well as garage door openers from LiftMaster, Genie, Sears, Allister, Moor-o-Matic, Chamberlain and many more. By offering this diverse collection of brands, we help ensure you get the look and operation you want out of a new garage door or opener. We want you to enjoy the very best customer experience possible. That’s why we offer free estimates on new garage doors and openers before work begins. This helps ensure you have as much information as possible as you make this important investment. We also provide warranties on parts and labor because it’s important for us to stand behind our work — and for you to enjoy peace of mind with your new purchase. When you need garage door repair in Fulton County, Ohio, Quality Overhead Door is here to help. We offer a team of experienced, knowledgeable technicians who can provide expert guidance as you consider the best course of action for your garage door. We respond quickly to calls for service because we know garage door issues at your home or business often represent urgent needs. We are committed to carrying a huge selection of products because your home deserves more than a generic, off-the-shelf product. Your home is unique, and it should have a garage door that complements its existing architecture and enhances its curb appeal. Craft the garage door of your dreams when you find the perfect model in our vast selection, then further customize by selecting optional windows, hardware or insulation. In addition to our selection of high-quality products for Toledo-area homes, we also offer commercial garage doors in Fulton County, Ohio. This selection of commercial products includes overhead and sectional doors, coiling doors, operators, fire doors, mega doors, fabric doors, high-speed doors and much more. Choose Quality Overhead Door when you want the best in commercial garage door installation in Fulton County, Ohio. 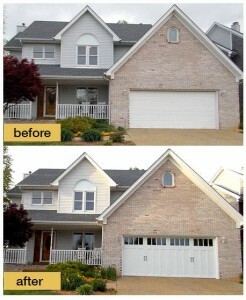 If you live in Northwest Ohio, you want the best in garage doors. That’s what we deliver at Quality Overhead Door, both to home and business owners in Northwest Ohio and Southeast Michigan. It’s our desire to deliver the best that has helped us earn the Angie’s List Super Service Award and an A+ rating from the Better Business Bureau. Choose Quality Overhead Doors for the best products and garage doors in Fulton County, Ohio.